The Alliance of Liberals and Democrats for Europe (ALDE) has requested an investigation of the contacts between the contacts of the France’s far-right National Front, with the Kremlin. It is not clear if the French government, or MEPs, should investigate them. National Front leader Marine Le Pen met a senior Russian official in Moscow on 26 May, underlining her party’s regular ties with the Kremlin despite East-West tensions over Ukraine. Le Pen, whose anti-immigrant, eurosceptic party previously secured a major loan from a Russian-owned bank, has fiercely criticised the West’s policy towards Russia over the conflict in Ukraine as overly hostile to Moscow. She emerged from the Russian parliament’s lower chamber last Tuesday after holding more than an hour of talks there with speaker Sergei Naryshkin, a senior Russian statesman close to the Kremlin. “Mr. Naryshkin and I see each other roughly once a year,” said Le Pen, who is seen as a major contender in presidential elections due in France in 2017. Le Pen’s party won the highest share of the vote in France in last year’s European Parliament elections. But the centre-right UMP party emerged as the clear leader in local elections in March and Le Pen herself is seen as only an outside bet for the 2017 election. Naryshkin told Le Pen that her party was “among the leading political forces in France”, according to a short statement on the meeting posted on the Duma website. Le Pen’s party secured loans worth €9 million from a Russian-owned bank, but Le Pen said on Tuesday that getting any further loans was “not at all the purpose” of her visit. She declined to say what other meetings she had during her “very short” visit to Moscow, which cherishes ties with certain European figures who could apply further pressure on the EU’s increasingly troubled unity over Ukraine. 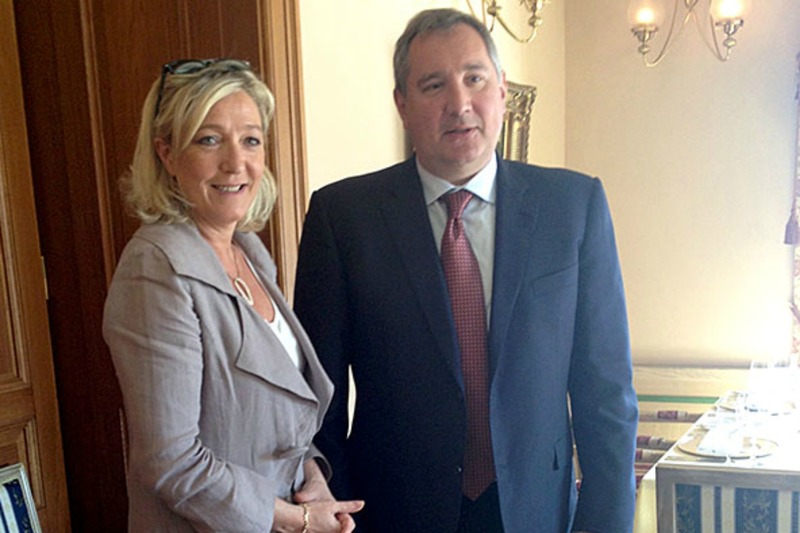 Photos published by the Institute of Modern Russia depict Marine Le Pen with Naryshkin and Deputy Prime Minister Dmitry Rogozin, also known as the “hooligan of the Kremlin”. ALDE Group Vice-President Petras Auštrevi?ius (Liberal’s Movement of Lithuania) for a prompt and proper investigation into the connections between the Front National and the Kremlin on Thursday(28 May). Maybe they should investigate Secretary of State John Kerry for meeting with Putin in Sochi earlier this month or Angela Merkel for telephone calls ahead of their June 9th meeting. Better yet, maybe they should just admit that it is none of their business. This actually comes from Lithuanian vice-chairman of ALDE. Nowadays, Lithuania is the prime stirrer of Russophobia in the EU. @ cortrand….I would think the eastern Baltic countries would try to be more conciliatory toward Russia rather than bellicose. In a recent US NATO command report it was cited that Russia could overrun Estonia, Latvia, and Lithuania in two days, whereas, it would take NATO a minimum of two weeks just to get approval for an armed response.